Horse herds, just like a small group of friends, become close and familiar with each other the more they’re together. However, introducing a new horse into the herd can be difficult, potentially leading to upset herds and potential conflicts. If you’re expecting to bring a new horse into your existing group, check out these tips for integrating the new horse smoothly. If you’re going to introduce a new horse, first take a look at your pasture and see if it will be safe for your addition. 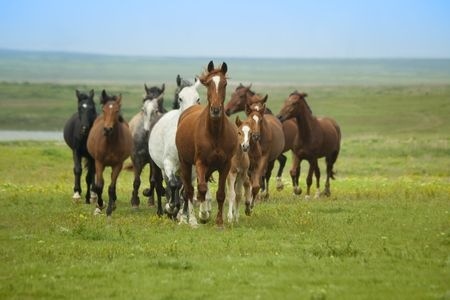 You want to ensure that your open space is large enough to allow your new horse an area to escape from the herd if at first they aren’t welcoming. Also, look for corners as if there is a conflict among your horses, they could become a dangerous area. If current horses corner the newcomer, being trapped into a corner could frighten the new horse and potentially lead to injury. If you can, get a thorough understanding of the current group dynamics in your herd before introducing a new horse. By knowing which of the group are the most dominant or which horses spend the most time with one another, you will be able to better prepare for the addition you are going to make. If you are unsure which one is the most dominant, observe the herd during their feeding time – observing the feeding order can give you more insight into which horse is seen as the leader. Don’t just expect that you can plop a new horse into your current group smoothly. Start slowly by introducing the new horse to the ranch or farm before stabling him or her with your current herd. Placing the newcomer in a pen by themselves next to your current pasture allows them a chance to get used to the land and gives your current horses a chance to sniff and get accustomed to the newest member of the group. Be careful, however, as not all horses are good matches. Have a plan ahead of time for what you can do in case your newest addition results in conflict among the herd. Based in Texas, Deer Creek Structures specializes in building quality horse barns and sheds that will keep your horses protected. Whether you need a new structure for your existing herd or need to expand your capabilities for your newest horse, we can help provide the perfect new structure for your ranch or farm. For more information on our products, call us today at 254-546-2276.